I’ve always been super intimidated by Indian cooking. 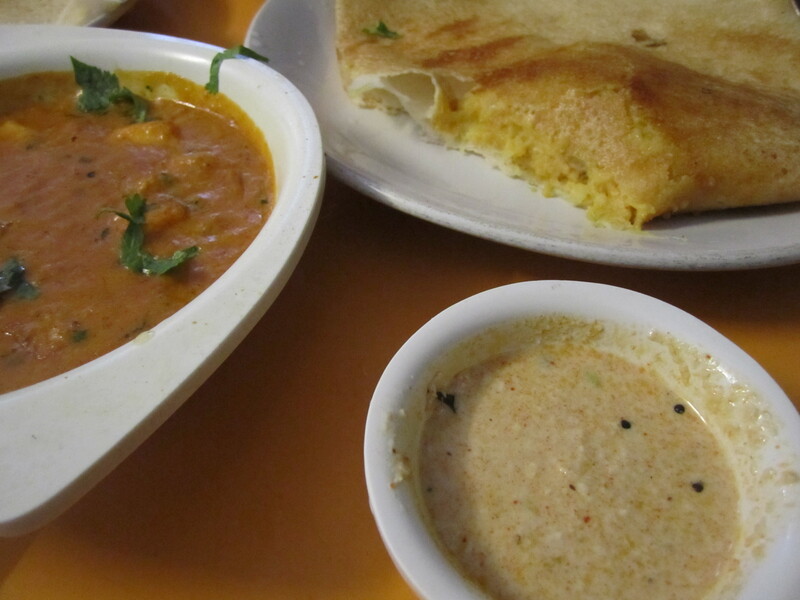 Before visiting the country, it was hard to get a real grasp on kormas versus koftas, and dosas and dal. Something about the foreign charm of ghee and cardamom kept my kitchen rather bland and the Indian restaurant well patronized. In attempts to discover something outside of my standard tikka masala, I’d time my visits to the lunch hour so as to sample the buffet. The real deal clincher was the continual output of fresh naan bread, washed down with pitchers of mango lassi. Needless to say, my lack of self-discipline quickly confirmed a ticket on the fast train to uncomfortably full. Not to mention the fast train to porcelain heaven. Subsequently, with my mother at my side, we staged a personal intervention and put a ban on ever again going all-you-can-eat. It was just toooo delicious. When we found ourselves in the restaurant alongside buffet buccaneers, we simply had to breathe deeply and look the other way. Our fate was sealed, and we calmly ordered controlled portions from the menu. This seemed to perplex the curious Indian servers, as whatever we ordered often times was included on the buffet. Before putting in our order, the slew of waiters standing at attention would one-by-one try their hand at defying the laws of surface tension. They’d miraculously fit one extra drop in our water glasses and reiterate, “Madam, the buffet?” Yes sir, we’re crazy (as well as pathetic). Can I have a “100-calorie pack” for dessert? Since returning from my trip to India, I’ve been trying to muster up the courage to recreate the deliciousness that was each meal. The other day, I caught a whiff of the spice blend I smuggled home while cleaning the cupboards. Okay, I lie. While cramming things in, it fell on my head. Either way, things were set in motion. 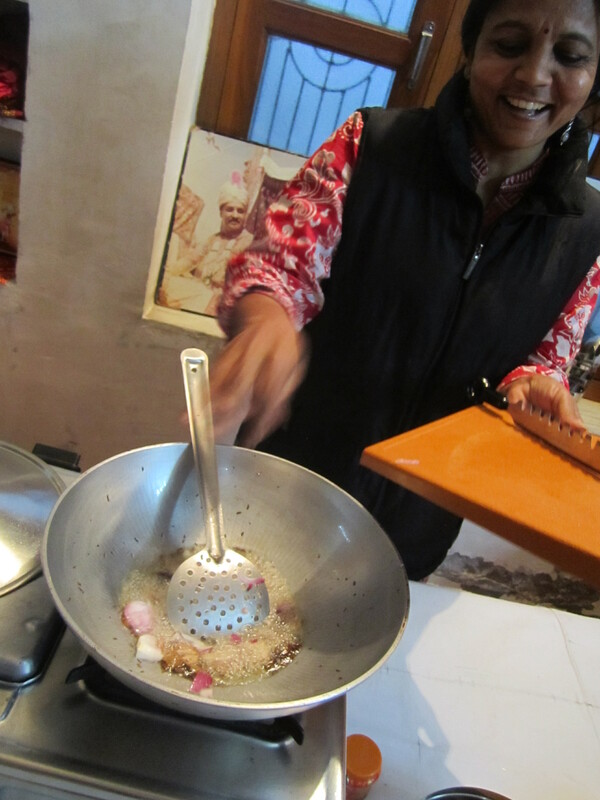 On our next to last eve in India, we were lucky enough to share a kitchen with Shivani. I was a little reluctant after realizing she was the wife of one particular shop owner. This guy had sent me on a mission for small bills, then upped his price and refused to bargain as soon as I was cash in hand. Regardless, she was the only cooking class in town and had many rave reviews. We were greeted at her home where she had a table set up and layered with ingredients. First on the agenda was chai while we discussed our menu for the day. We learned to make many things, but most importantly, Shivani made Indian food approachable. I took what I learned, added a subtle twist, and finally achieved masala enlightenment. Here’s a run-down of the basics. 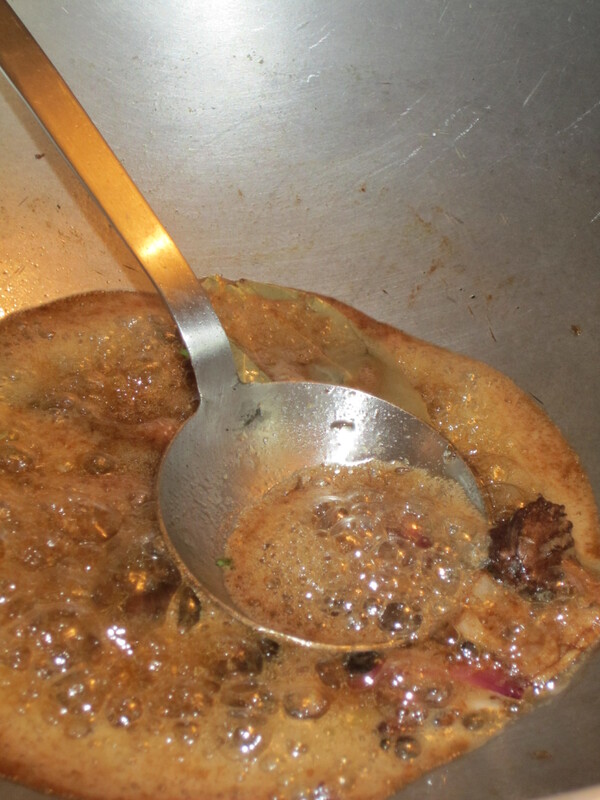 Every Indian “gravy” starts with a base of browned butter and caramelized onions. I had always been under the impression that most Indian foods began with ghee. This isn’t necessarily the case. Shivani started her gravies (referring to the saucy base of any “wet” curry) with plain ol’ butter. Basically, you just start out by melting the butter in a medium-hot pan. Pay close attention, and when the butter begins to get the golden tone, toss in your “hot” spices. Wait just a minute until they pop. Next, add your onion. Shivani liked to start with red onion, but for my dish I used yellow and it worked just fine. Once the onion is in the pan, turn down the heat a bit and allow to gradually brown. To avoid a case of Dehli Belly, simmer until the butter separates from the curry. When the onions have come to a nice even brown, turn the heat back up to medium-high and toss in the ginger/garlic paste. Saute quickly. Next, add garam masala, salt, tomatoes, water and bring to a simmer. Allow the mixture to simmer until you can see little bubbles start to form across the surface. Around the ring of the bubbles and at the edge of the curry, you should see a clear liquid starting to separate from the gravy base. This is the butter. Once this happens, your bowels are safe and you’re ready to move on. When you’ve made it this far, pat yourself on the back and crank up the sitar. You’re almost there. All that remains is just stirring in the final ingredients and heating the dish through. 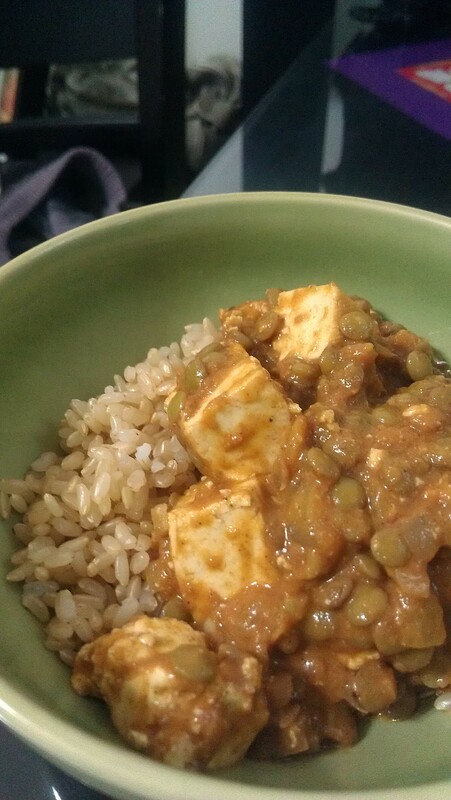 I promised to veer away from chicken, so I’m going to recommend adding in tofu as a stand-in for paneer. While I’m not exactly sure what it is that separates the two, it worked just fine. 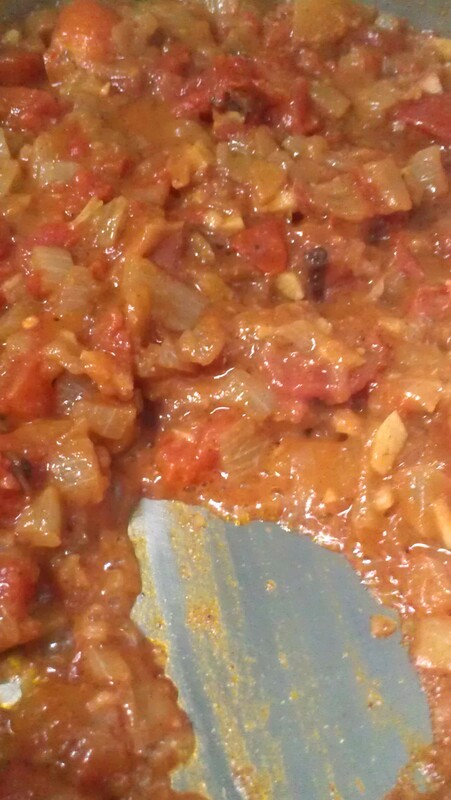 If your sauce seems a bit dry, feel free to add more water at this point and just allow to simmer to thicken. Special thank you to Tak Shivani for sharing her culinary secrets. If you’ll be in the Pushkar vicinity, I highly recommend her course.